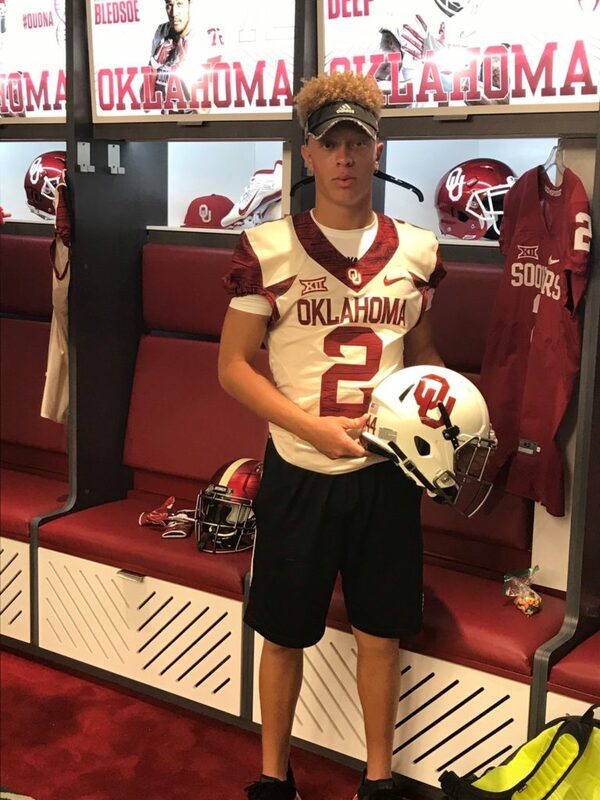 Last week, I tweeted a “hot take” about Spencer Rattler’s sophomore highlight film being every bit as impressive as a certain former Sooner QB commit who happened to flip to a certain archrival. Obviously I was referring to Cameron Rising. If you read my evaluation of Rising’ sophomore film, which TFB released just before his commitment to OU, then you know I was a big fan of his game, especially considering he was only a high school sophomore (his eval is here: TFB: Spotlight on Rising). Just watched 2019 QB Spencer Rattler's film. Hot take: His sophomore film as is good as the sophomore film of a certain QB who flipped. Now, enter Spencer Rattler. His 2016 film is absolutely on par with that of Rising’s, and that is not “sour grapes.” Rattler can flat out play. For this particular evaluation, I decided to sort of lump all the positives together, and then do the same with the negative takeaways. Rattler’s release is quick. He gets the ball out of his hand in a hurry. Often times, this quick release, while still a positive, can lead to not being able to put the proper touch on a pass. That is to say, when a receiver is in the middle of soft coverage and has stemmed his six yard hitch route you don’t need to throw him a 90 mph fastball. Rattler shows the ability to have that lightning quick release, while at the same time putting a catchable football in the air. Touch is not purely a physical piece of a quarterback’s game, it is also highly mental. You have a split second decision to make after making your read and it has to be immediate. For a sophomore, this part of his skill set is impressive. Throwing on the run seems to be something at which Rattler really excels. There are several instances on film when he rolls to his right and is able to fire a dart to a receiver downfield without causing the receiver to work too hard to secure the catch. This tells me a few things. Number one, Rattler has a strong arm. You don’t need to throw 70-yard bombs very often in football; I have no idea how far Rattler can throw the ball and, frankly, I don’t care. The fact he can flush out of the pocket and “tiptoe” a laser 40-yards downfield is impressive to me. I like that “gunslinger” mentality. This is where he is like Baker Mayfield, in the fact that it is obvious he has confidence in his ability to keep a play alive and turn it into a positive gain. This leads me to my number two. Rattler has great field vision. See my comment about Mayfield and watch Mayfield film to know just what I mean. Rattler also displays great rollout accuracy. I am a big stickler for a quarterback knowing how to have the proper mechanics when he is rolling to the right or left, especially to his weak side. Rattler, being right handed, gets his shoulders and hips in the right spots and delivers some really beautiful passes to open receivers on roll outs to the left. To the right side, he just looks like he is in the backyard playing catch with a little brother. It is effortless. Rattler is very quick. He does not appear to be straight line fast, but, with the way he keeps his eyes downfield, he does not need to be a guy who will pull the ball and run for 80-yards. He has a knack for planting his foot and getting north and south, but he also shows that Mayfield ability to give a guy a dead leg and leave the guy’s jock on the ground where the tackle should have been made. As I always remind the readers, it is already tough to take negatives from such highly talented players, but even more so considering I am watching highlight films. With that in mind, there are really two areas I would like to see Rattler improve upon. I’ll just list them in a numerical fashion. #1 – He tends to sometimes drop the ball too low for my taste. Sure he has a fast release, but there are a few (and I mean just a few) times the ball can be seen dropping to his waist line. This is a big “no no” for a couple of reasons. It can negate your quick release, but it also makes you susceptible to turning the ball over to backside pressure. This is, however, a simple fix and one that just take reps both physically and mentally. #2 – This is super nitpicky on my part BUT…there are a few instances on film where the defense brings pressure off the edges and succeeds. Rattler trusts the fact he is probably quicker than the defenders and escapes to the outside rather than just step up into the pocket and deliver a ball quickly. Again, this will be something I think he will grow out of as he matures as a player. I had to remind myself I was watching a kid’s 10th grade film when I was making this very short list of negatives. You can sometimes see Mayfield doing this; however, if you compare Mayfield’s 2015 season to his 2016 season you can see how much he improved in this area. It’s natural to want to escape to the outside, but sometimes the best option is know your read progression and just step up and into the middle and deliver a ball or get the yardage you can. Overall, if you watch this kid’s film you can’t help but be impressed. He really does remind me of Mayfield in a lot of ways. He’s smooth, he has that gunslinger mindset, he has a great set of feet, and admirable quickness and speed. He is a perfect quarterback for the current OU offensive system and one that, should he stick to his verbal, will be highly entertaining to watch.